So to start you need a clean palette. Wash and condition your hair the day before you are wanting to dye it. If you have fragile hair or virgin hair (never been colored) I would suggest you do a strip test to see how the color takes for you. This can be accomplished by dying one small strip of your hair to get a reaction without doing your whole head. That way if your hair reacts poorly, you haven't damaged all your hair. 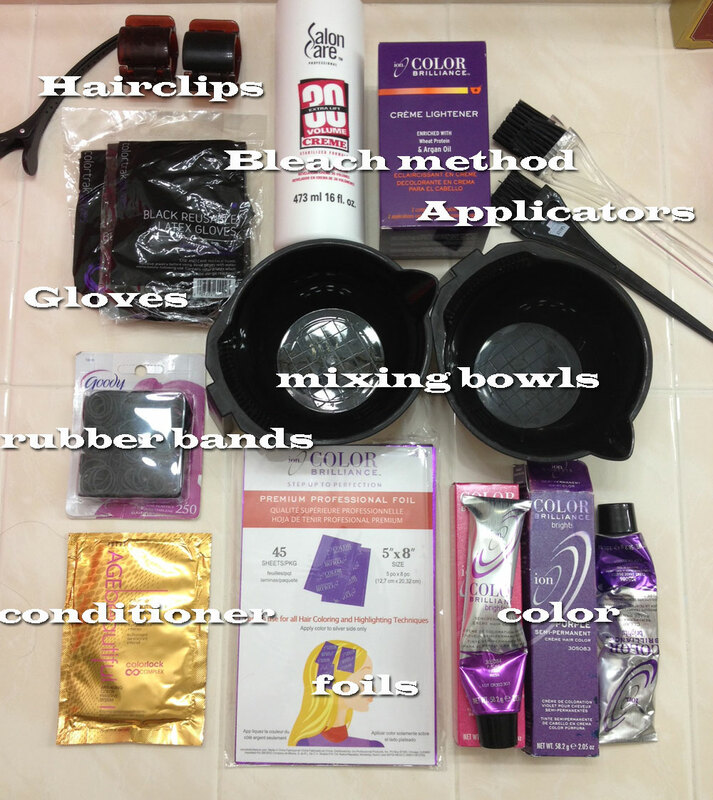 Here are the supplies I use. I get them all from Sally's beauty supply store. The employees are very good about helping so don't be afraid to ask questions. Aside from this list you need a few towels that you do not mind messing up, and a shirt to wear that you also don't care about or a plastic cape. Also a bottle of conditioner that is white in color. Doesn't matter about brand so long as it's white. I like to put old towels where I'm standing in case of drip. Keep in mind I recently went from pink tips back to brown, so your hair will not show pink like mine. It will just be bleached. I leave it on for about 15 minutes then keep checking every 5/10min after that. Now that your hair is dry, use the same rubber band technique you used to bleach except put the rubber bands just before where the bleach starts. 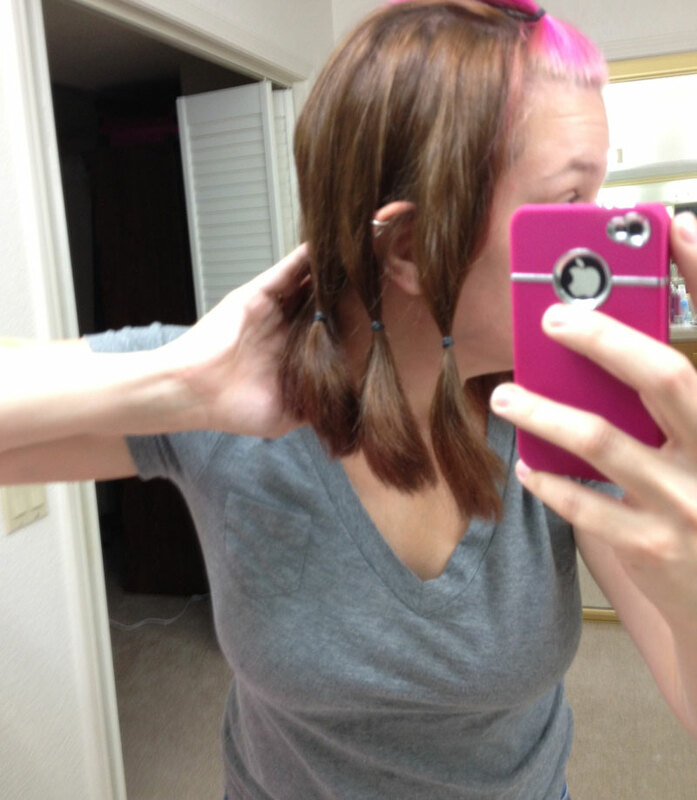 Make your pieces thinner pony tails this time adding less hair to each rubber band. Now pull out your mixing bowls put your first color choice into one (about 1/4th of the tube) and the second choice into another. (Same 1/4th of the bottle) now squirt a tiny bit of the bottles conditioner into each. 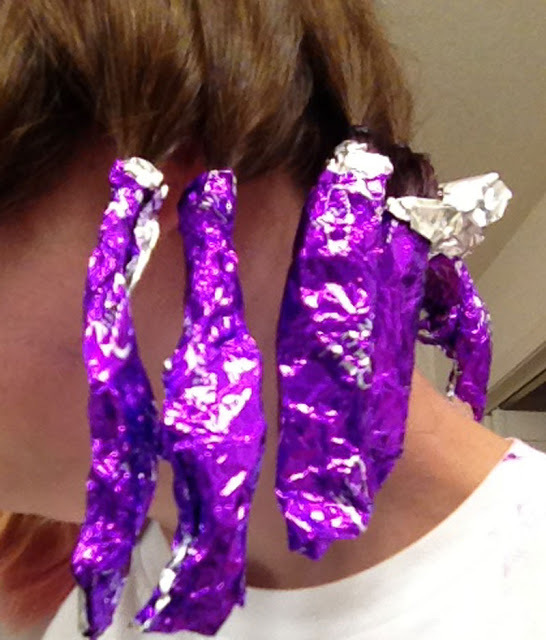 This will help thin out the dye a little. I comes out quite think from the tube. 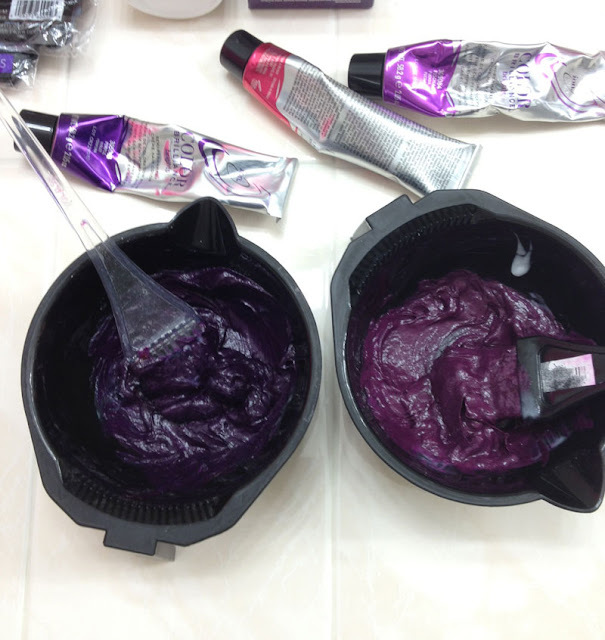 Now mix both using separate applicators thoroughly. Remember to wear gloves and put something down on the floor before you start. It's messy sometimes. Pin the front rubber bands up and out of the way again and start with the back ones. With a foil behind your hair, apply the first color from the top of rubber band to about half way to the bottom. Flip hair then add color to the other side. I like to make sure it's done right the first time, so I do this by a sink. Here is my process. After applying the first color, I put the applicator down and work the dye in with my fingers. 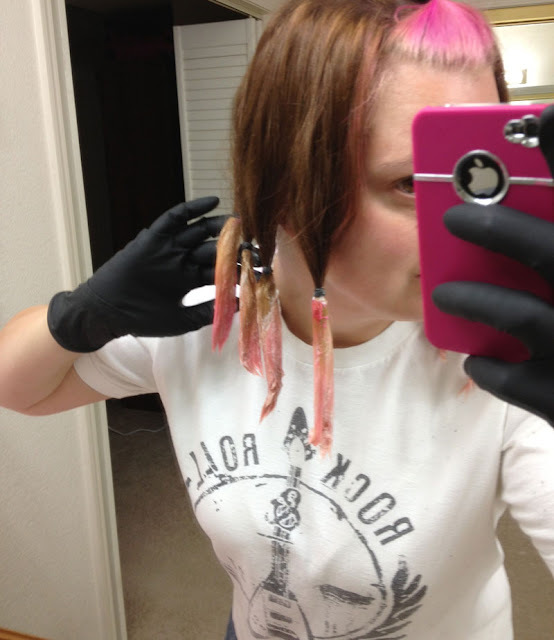 (make sure your wearing gloves) I work it in until the stop point making sure to get all the layers of hair. 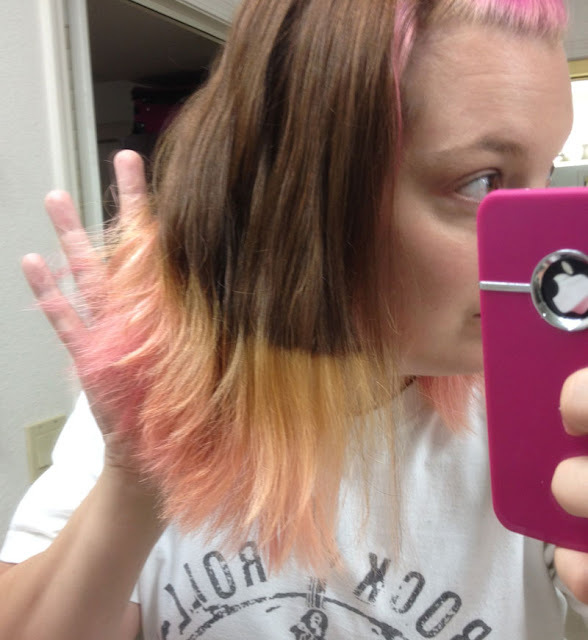 This working in the dye method makes it so that I do not have bleach spots later. It ensures color throughout. You do not need the mixing line to be straight. In fact I prefer that it's not. Now wash your gloves off and apply the second color. Work the dyes in together where they meet in the middle and apply the second color all the way down to the bottom tip of hair. 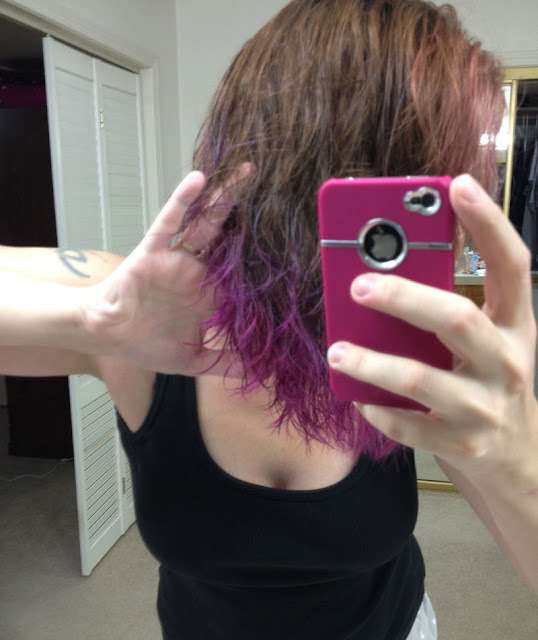 Again, work the dye with your fingers well to ensure coverage. Wash gloves again them fold your foil bottom upwards to cover ends then fold left to right. After you have covered all your pieces, remove your gloves and let it settle for 30/40 min . Times up! Put your gloves back on and removes the foils. Rinse hair thoroughly with COLD water until the water runs clear. After water is fairly clear work conditioner into the colored pieces. Let sit about 2 minutes then rinse out. Ta da! This photo really stinks (I'm sorry, bad lighting) The color turned out great though. I had a few bleach spots that I touched up, but this almost never happens) The top is pulled up in a headband, but when not pulled back you can see the ombre detail in the lines. 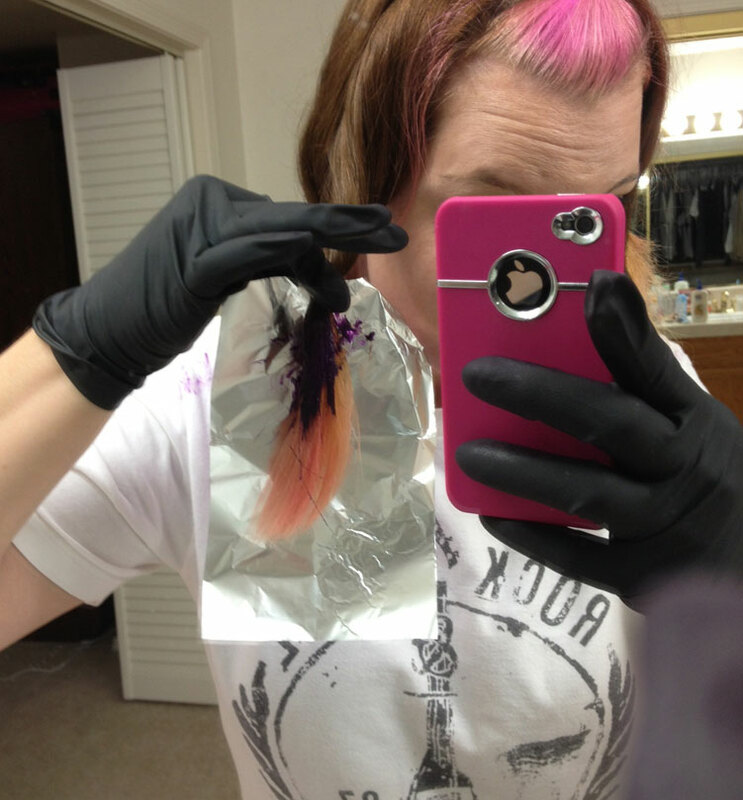 The colored dye I use is Ion Brights. It's about 5.00 a tube and is semi permanent. 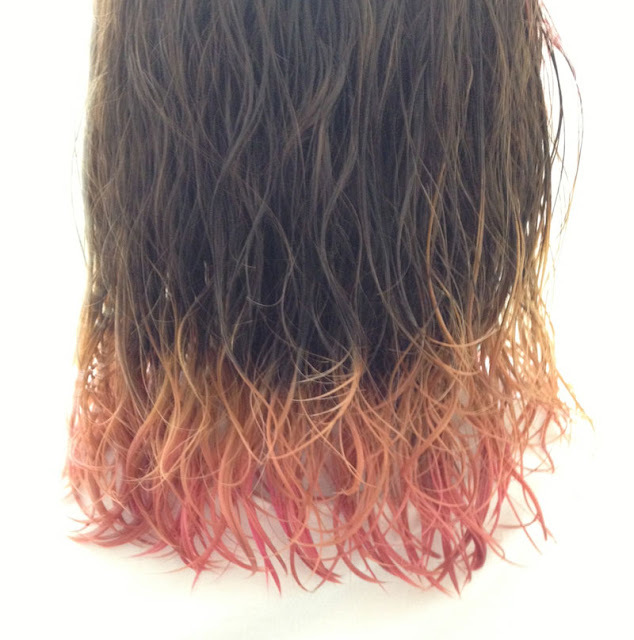 There are currently no permanent dyes in these bright pigments. 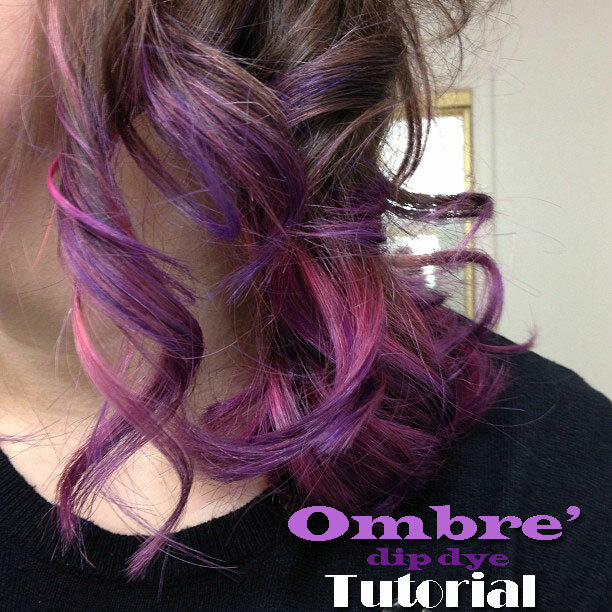 For this tutorial I used ion brights in purple and fuchsia. 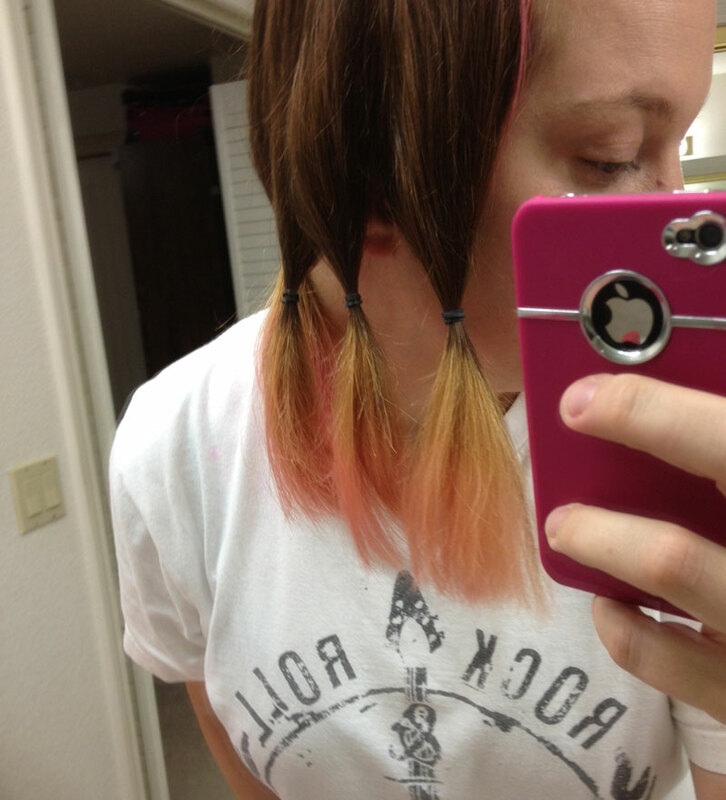 Because this is a semi permanent dye wash every other day with cold water for the longest lasting color. This is a much easier process if you have another person to help you so keep that in mind if you decide to try. 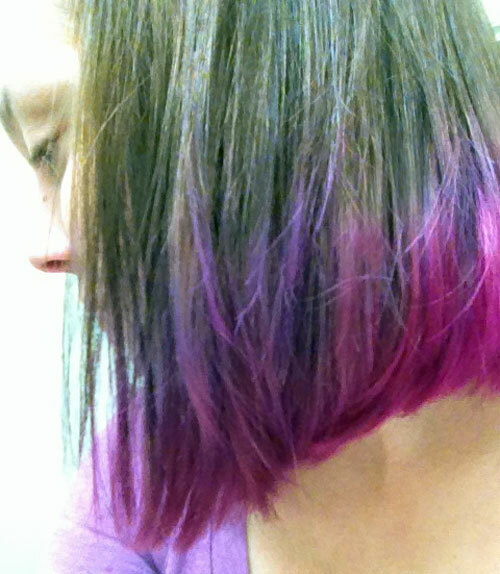 The back is really hard to get perfect if you have shorter hair like me. Thank you for Reading and I hope you get to try it. Just a reminder, WEAR GLOVES it stains badly. Here are a few resource videos I really liked and they helped me come up with my process. I found this one later and love her method for long hair. I just want to say that your different hair styles are looking so cool, thanks for the sharing.